Click to download this free wedding program fan. Fan-shaped DIY printable wedding programs offer a fun and unique way to add a special touch to your ceremony. They're also perfect for a warm spring or summer wedding, especially if the wedding will be held outdoors. 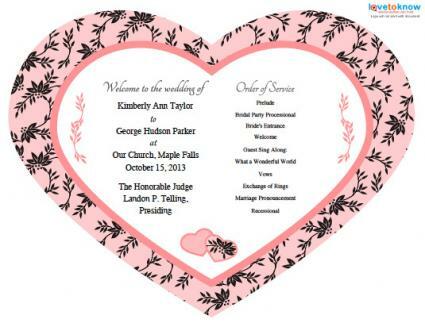 A heart-shaped fan makes a wedding program extra special with its romantic flair. The wedding fan programs on this page can be customized with your personal wedding details. Be sure to print them on heavy-weight cardstock so they don't flop over. Click on the fan's image, and an editable printable will open up. If you need help downloading the printable, check out these helpful tips. Click on the text to replace to customize the program text with your wedding info. Proofread the program to make sure there are no typos or misinformation. Click the diskette icon to save your changes. Click the printer icon to select the number of programs you want to print, and then click "Okay" to print. Click to download this free wedding fan program. Assembling your fans will take a bit of time, especially if you're having a large wedding. Plan to start working on them well ahead of time, or ask the bridesmaids to come over and help. After printing your programs, carefully cut out each fan with sharp scissors or a craft knife. Try to keep the curved edges as smooth as possible so your programs look professionally made. Use a hot glue gun to attach wavy craft sticks to the back of the programs to use as handles. You can also use jumbo craft sticks if you prefer, but it's best to avoid using popsicle sticks because they don't offer as much gluing space and stability. Store the programs in a pretty wicker basket that they can be distributed from at your wedding site. If you're still searching for the perfect design, one of the following sites may have what you need. Aylee Bits: This site offers a free printable program that collapses like a real fan, but you also have the option to order them made by the company. The program details are printed on the individual pieces of the fan, and all the pieces are joined at the bottom with an eyelet, ribbon, or brad. Absorbent, Ink. : This site has a large variety of fan designs to offer, and prices start around $1.30 per 125 fans with full-color printing on both sides of the fan. Just click on any fan you like for full details and pricing on larger orders. Beau-coup: You'll find some very simple yet attractive fans that the company will customize with your order at Beau-coup. The fans measure just over 11" x 7", and you can choose to have plastic or wooden handles, or go with no handles at all and just tie ribbons onto the fans. The cost runs between $28 and $32 for a set of 25, and there is a minimum purchase of four sets required. There is also a $138 set up fee for the custom printing. 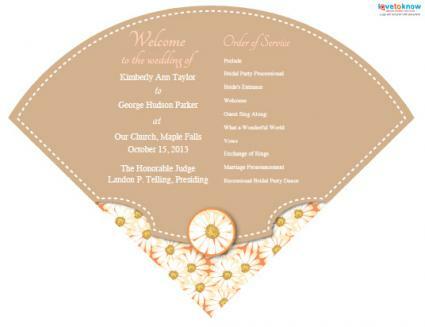 Fan wedding programs can be a pleasant and practical alternative to classic program designs. By choosing a themed shape and planning the design carefully, this unique type of program becomes a worthy keepsake of your special day.